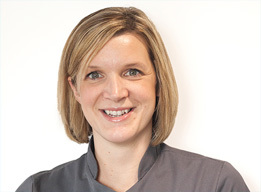 Liz started with the practice in 1997 and qualified as a dental nurse in 1999. She then went on to study Dental hygiene in 2001 and qualified from Birmingham in 2003 returning to work as a hygienist between both practices full time. Following the births of her two sons Liz now works part-time at the Stratford practice. She enjoys carrying out Zoom tooth whitening as part of her role within the practice. Liz has previously been involved with the implant team and also with the oral health team, organising oral health workshops for our younger patients. She now teaches part of the oral health certificate for qualified dental nurses with Arden Dental Training centre.